We recently added some new reusable water bottles to our collection. The kids were ready for something a little larger, and I was glad to find a stainless steel bottle that didn't require a plastic "sip" top. 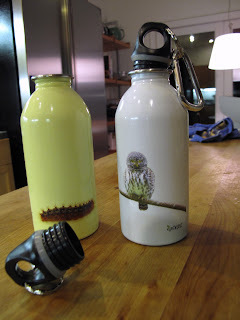 The Earthlust bottles have appealing graphics that my kids were excited about. They are designed by a California family which produces them in China under strict observation. EarthLust bottles are made from high-quality #304 food grade stainless steel, which is naturally safe unlined. They also use non-toxic paints and BPA-free safe polypropelene #5 caps. Earthlust also is a member of 1% for the Planet. There are many good reusable bottles on the market, and to be fair, that is a great thing. I think it is great to have choices between brands and styles to find the one that best suits your needs.